Fourth of July is always one of the summer's most festive times. 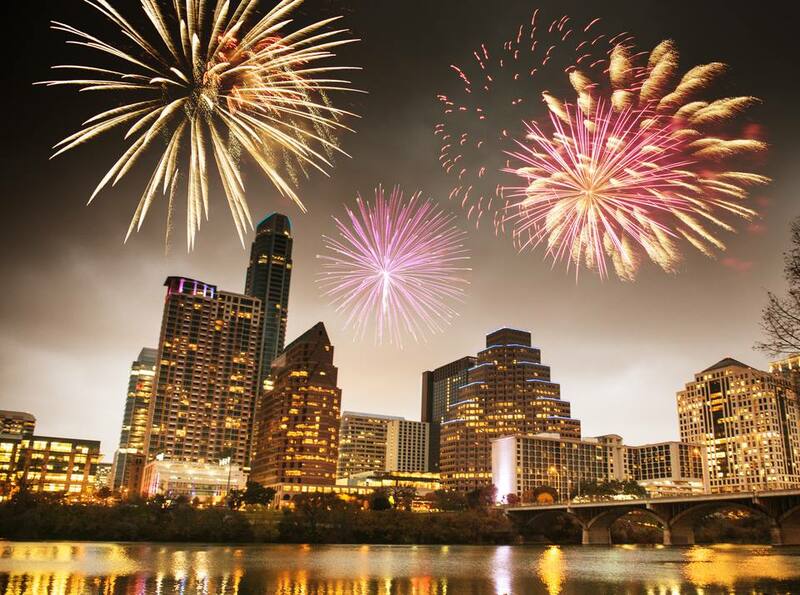 Sure, special events are celebrated throughout Texas on Independence Day, but a few cities and towns in particular go all out each year. Officially designated as the "Fireworks Capital of Texas" because of its weekly summer fireworks displays (Fridays at 9:15 sharp), South Padre Island certainly lives up to its nickname on Independence Day when a huge fireworks extravaganza brightens the sky over Laguna Madre Bay. The fireworks display can be viewed from condos and restaurants on both South Padre Island and across the bay in Port Isabel. In addition to this holiday event in Texas, this popular summer vacation spot also offers visitors a full slate of vacation activities, including fishing, swimming, kiteboarding, parasailing, surfing, and sandcastle building. Texas' state capital of Austin is a festive place to spend the Fourth of July. Every Independence Day, the H-E-B Austin Symphony Orchestra performs its annual Fourth of July Fireworks & Symphony at Vic Mathias Shores. Other celebrations include Willie Nelson's 4th of July Picnic at Circuit of The Americas and the Hill Country Galleria Independence Day Celebration. For other summer activities, you can go swimming at Barton Springs, waterskiing on Lake Travis, and exploring underground wonders at Longhorn Caverns. While you're in Austin, also make some time for a stop at the Texas State Capitol. Centrally located in Texas Hill Country, Austin gives visitors the option of making day trips to surrounding towns and attractions. One of Texas' tiniest towns holds one of the largest Fourth of July celebrations each year. Luckenbach, a small Hill Country town made famous by Willie Nelson's ballad, holds its Family Fourth of July Picnic every Independence Day. This free celebration features live music, games, food, drink and, of course, the World Famous Luckenbach Lawn Mower Parade. Summer is one of the best times to vacation in San Antonio, nicknamed Alamo City. Known for some of the state's biggest and best celebrations, it should come as no surprise that Alamo City honors the Fourth of July in a big way, too. Every year the city sponsors a huge fireworks show at Woodlawn Lake Park. Additionally, SeaWorld and Six Flags Fiesta Texas stage their own Fourth of July fireworks displays, with Six Flags starting the party early on June 30 and going through July 4. Also, visit the arts and crafts show along the River Walk and Freedom Fest at Market Square. In the morning at Fort Sam Houston Cemetery, reenactors will battle the American Revolution for the 34th year in a row. Also while in San Antonio, don't miss the Natural Bridge Caverns. If you're visiting North Texas in the first week of July, consider spending time in Dallas. Can't get enough fireworks? On July 3, go to Addison Circle Park for an air show (visible all over the city), a 30-minute fireworks display, and a concert afterward. Then, on Independence Day proper, the Big D's Fair Park Fourth annual free event features food, games, live music, and fireworks in Fair Park on the Fourth of July. In addition, Dallas has many other summer activities to fill out a vacation. Check out water sports on Lewisville Lake, thrilling rides at ​Six Flags, and Texas' oldest zoo.